← Great Creative Session, the breakout has began. If you have not got enough of Sir Ken Robinson, this is a MUST BUY book. We find this a highly recommended book, if you are considering homeschooling – this is a MUST buy! If you are not homeschooling, you BETTER BUY IT! haha! We are deeply inspired by his talks and works. You can buy the book from Amazon HERE or from local bookstores. Here’s an excerpt from GoogleBooks. The element is the point at which natural talent meets personal passion. It is here that people feel most themselves, inspired and able to achieve at their highest levels. In this ground-breaking book, world renowned creativity expert Ken Robinson identifies a crisis in education and business: whether its a child bored in class, a disillusioned or misused employee or someone who feels frustrated but cant quite explain why, too many people dont realize what they are capable of achieving. Through stories of people – like Vidal Sassoon, Ariana Huffington and Matt Groening – who have recognized their unique talents and been able to make a successful living doing what they love, Robinson argues that age and occupation are no barrier and explains how it is possible for each one of us to reach our element.With a wry sense of humour, Ken Robinson inspires us, above all, to reconnect with our true self it could just change everything. 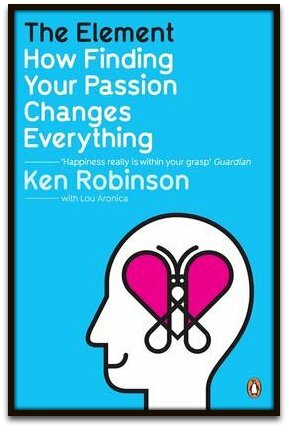 This entry was posted in BOOKSHELF, Publications, Resource & Materials, Unschooling Lessons and tagged creativity, Ken Robinson, passion, unschooling. Bookmark the permalink. Sudah dapat pun, dah habis baca pun! Sedang implement..
Can you please help to buy 1 and help to post to me? I am from Penang. I can bank in to you first. SOrry to border you ya. Coz i think bookxcess dont do delivery. I bought mine in Penang last year! Hi Shalom, may i know where do you buy it? How much was it ya? 🙂 Thanks. Hi Sin Dee, Sloane here. There is both Chinese copy and English copy. Let me see if I can get my copies back from my students who pinjam-ed. We covered this topic during our Holiday Program last year (for kids 14-21).